Congratulations, Grace! She now has a younger hound sister to play with. When my family adopted me, I had never seen the inside of a house or a car and was a bit skittish. My loving family has taught me lots about living inside and taking long walks on a leash, but I still struggle with strangers, tight places, and kids who move in ways that sometimes surprise me. I am a sweet girl who is looking for a family who likes to take long walks, has a big backyard to run, and has the time to work through my challenges. I love other dogs, large dogs in particular because I love to play hard with them, and I love to paw my favorite people. Clarabelle is on Chinese Herbs to help with her anxiety, and must remain on this. 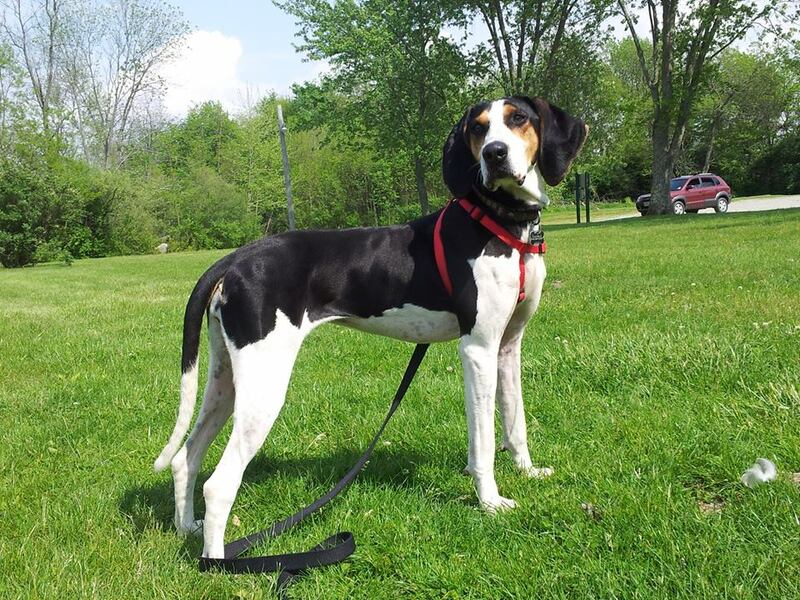 If you are looking for a beautiful hound who loves to play and run, call us at 937-265-5178. Download the adoption application. Tucker is a 3-4 year old hound blend who loves other dogs and running outside. He is good with kids, but is shy with men. He’s had some issues with men approaching him. Our staff will discuss this at the time of your visit. Tucker is extremely affectionate with all of us including women and children. He doesn’t mind sharing a home with other dogs, but prefers not to live with a cat. He is worth meeting!